When a new patient comes to our office and they only want a chipped tooth taken care of, it is my responsibility to examine the patient fully. The chipped tooth is an issue that certainly will be addressed, but the entire health of the mouth and well-being of the patient is also our concern. For example, it would be wrong for us to fix the tooth, but neglect to do a soft tissue exam (which could potentially reveal oral cancer), or fail to look at an abscessed molar or bleeding gums. 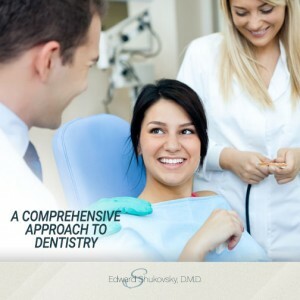 Comprehensive dentistry is just that – looking at the global picture. Patients have a right and a need to know the status of their oral health. Very often, patients will ask why we need to take a detailed health history. This is part of the comprehensive nature of what we do. Remember that we may need to prescribe an antibiotic (“Do you have any allergies?”), inject an anesthetic, or prescribe a sedative (“Are you pregnant?”). “Do you snore?” – Dentists treat snoring and assist physicians in treating sleep apnea with oral appliances. Getting to know our patients as best we can is always a goal. There is a distinct difference between restorative and cosmetic dental care. Restorative dentistry refers to functional health of the teeth, gums, and surrounding areas. Cosmetic dentistry addresses the desire to make the teeth and gums look good. Patients want bright teeth that look beautiful… and we can do that! However, eliminating gum disease or repairing a fractured tooth are concerns that need to be addressed. My aim is to fix restorative issues using a cosmetic approach for results that rejuvenate the function as well as the appearance of the teeth and gums. I view cosmetic dentistry as an integral part of restorative dentistry, but achieving and maintaining a healthy mouth must be the primary objective. For example, some patients will visit my office and request that I fix their smile. When I explain that we will likely need to take a full-mouth x-ray as part of the initial examination, they may ask why I need to look at the teeth in the rear of the mouth where they are not really visible. These patients are not thinking about the health of their smile – just the cosmetic appearance. It is our job to educate them in the importance of looking at the entire oral/systemic environment. At our practice, we never simply restore a front tooth or teeth without paying attention to what is going on with the rest of mouth and the health of the patient. For me, this is an ethical issue: our first goal is to bring the teeth and gums to health. We also consider the cosmetic state of the mouth an important concern, which is why I always use an artistic eye when designing the treatment approach for restorative procedures. I am proud that my staff and I take a more global view of dental care, promoting and protecting the function of teeth, as well as the beauty of our patients’ smiles.